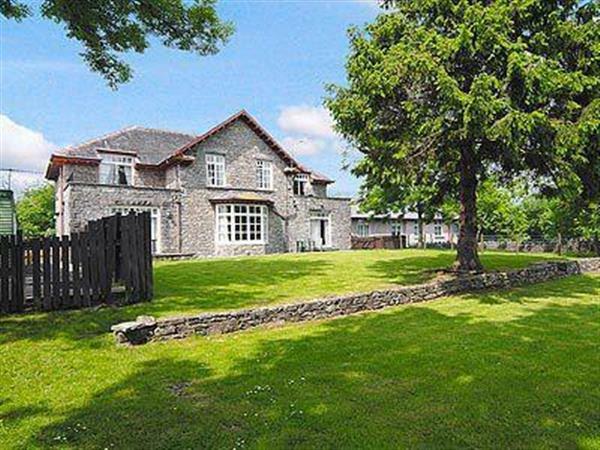 Just 20 minutes from Windermere, these holiday properties are set in lovely countryside and ten acres of landscaped grounds, facing south, with wonderful long distance views to the sea, and to the hills beyond. This large country house set on a wooded knoll has been skilfully converted into six spacious holiday houses, which are owned by the Caravan Club Ltd and situated on the edge of one of their immaculately kept small touring caravan parks. The house consists of a two storey cottage wing (W42981), a first floor apartment (W42982), a ground floor garden apartment (W42983), two ground floor apartments (W42984 and W42986) and a first floor balcony apartment (W42985). There’s a lot to see and do in the immediate area. Close by is beautiful Cartmel Priory and the stately homes at Holker Hall, Sizergh Castle and Levens Hall. 3 miles west along the coast is the refined small seaside town of Grange-over-Sands with lots of shops, golf and fishing. The properties make an excellent touring base for the whole of the southern Lake District. Shop 3 miles, pub with food 400 yards. All on first floor: Living room with patio door. Dining room/kitchen. 1 twin bedroom. Bathroom with shower over bath and toilet. Gas central heating and electric included. Cot. High-chair. DVD. Electric cooker. Microwave. Washer/dryer. Freezer. Garden. 10-acre grounds. Balcony. Ample parking. No smoking. Holidays at Balcony Flat 2 run from Saturday to Saturday. For a better idea of where Balcony Flat 2 is, you can see Balcony Flat 2 on the map below. Balcony Flat 2 is in Cumbria; should you be on the lookout for a special offer, you can find all the special offers in Cumbria. It's always worth checking to see what is on offer at the moment. Do you want to holiday near Balcony Flat 2 (W42985), you can see other cottages within 25 miles of Balcony Flat 2; have a look to find your perfect holiday location.